Point-of-care devices are highly desired not only in developing countries, but also in developed countries for the medical detection for remote/rural areas and home use. Compared with conventional bulky immunosystem widely used in central laboratories and hospitals, point-of-care device is usually cost-effective for each test, with small footprint and light weight, and however tends to suffer low sensitivity and inaccurate quantification. 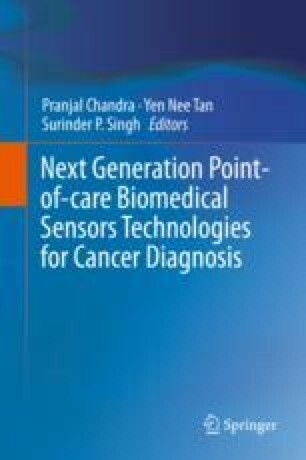 So some signal amplification mechanisms are required for the development of a reliable point-of-care device with high sensitivity for clinical use, such as early-stage cancer detections. In this book chapter, we introduce in detail for the development of point-of-care devices based on gold nanoarray generated plasmonics, i.e., localized surface plasmon resonance (LSPR). We have demonstrated that the gold nanoarray sensing chip can be fabricated in a cost-effective way by combining the nickel mold fabrication and nanoimprinting, and the sensing chip can be used to detect the clinical related biomarkers either by direct one-step assay through the LSPR absorption peak shift detected using a portable optical spectroscopy, with example given for cardiac troponin I (cTnI); or by a sandwich assay with its fluorescent label signal amplified by LSPR to achieve higher sensitivity, which can be detected on a commercial microscope or home-developed fully automated point-of-care device, as exemplified by prostate specific antigen (PSA) detection for prostate cancer, thrombin detection for blood clots, and procalcitonin (PCT) detection for sepsis. The advantage of the gold nanoarray LSPR-based point-of-care device is that the sensing area can be as small as the light beam, the sensing chip can be sealed in a microfluidic channel and use a little amount of the analyte and bio-reagent, and the optical signal can be detected by images to facilitate the future multichannel detections with little additional cost. Our fully automated point-of-care device detects the PCT with only 50 μL of analyte, and provides the data with 30 min at a test cost of less than 10 US dollars. Our experiments also demonstrated that both kinds of point-of-care devices are with enough sensitivity for clinical use. The authors would like to express their gratitude to the A*STAR, Singapore, for funding the project 102 152 0014, and Ministry of Education, Singapore, for the project MOE2013-TIF-1-G-024.